Elementor is a free and open source drag and drop page builder for WordPress, it is getting the best response around the web as it let seamlessly build the pages in WordPress with plenty of options and user-friendly interface. we have reviewed Elementor WordPress plugin in our previous article. Here we have discussed the new Elementor Library introduced by Elementor team. Elementor Library is a collection of professional predesigned templates which can be applied to your WordPress pages. One more interesting thing is that you can save your page or section as a template so that you can use it in other websites and save your time and energy. 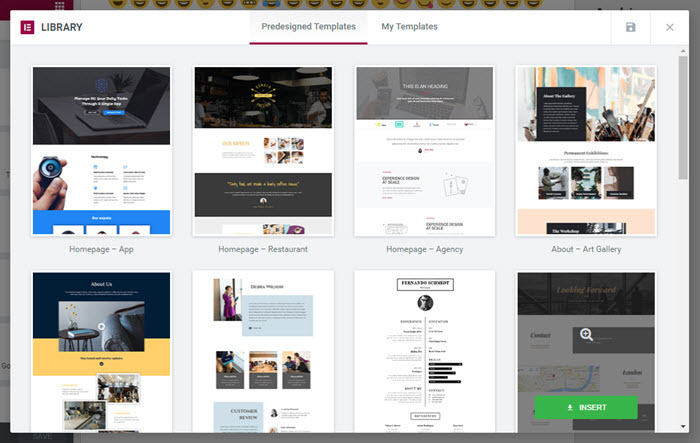 Elementor team is working hard to make Elementor page builder better and more user-friendly, till now it has released many features and elements such as image gallery, image carousel, testimonials, background overlay, box shadow, animations, soundcloud and social icons widgets. And this time, it has come up with the Elementor Library which surely helps designers to be more productive. You can find your saved template in “My Templates” tab. It is also possible to import or export saved templates to the different websites. Check out the Elementor library templates. Any additional sources to download layouts other than their official page. I like the concept of having single theme, with Elementor and just downloading layout specific to their type of work I am doing. Reduces lot of pain finding new theme and customizing it!! !